It’s finally fall here in New England, and the insects are on their way out – either dying, or bundling up for the winter. However there are always a few that cling to life through the first few cold nights, unwilling to admit that summer is over (I know that feeling quite well). 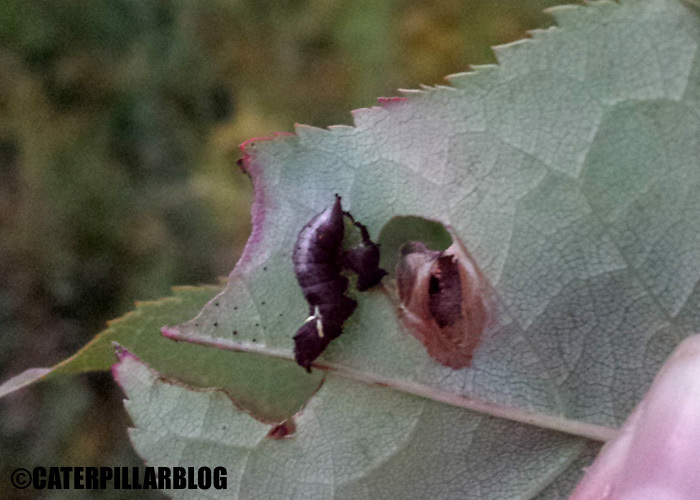 Here are a few caterpillars I found while walking in a nearby park at dusk. First is Schizura unicornis, the Unicorn Prominent, of the family Notodontidae. In this photo you can see the “horn” from which the name is derived. It looks as if the caterpillar is molting, with the old head capsule just barely clinging to the head. This species overwinters as a larva, fashioning a protective cocoon in leaf litter. They wait until spring to actually pupate, which is unusual amongst caterpillars (typically pupation occurs in the fall, and the winter is spent as a pupa). I imagine these caterpillars will be above ground feeding until their host plants succumb to the cold. 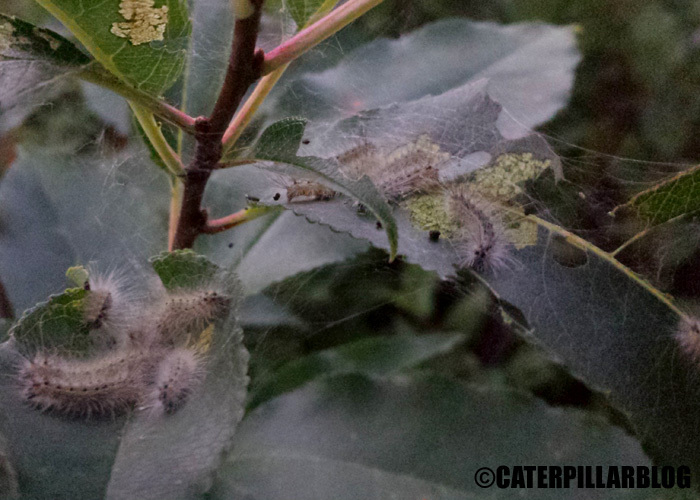 These caterpillars appear to be Hyphantria cunea, the Fall Webworm, of the family Erebidae. There were several fuzzy clumps of them on various plants, surrounded by loose webbing. These guys will continue to live gregariously in their messy webbed homes until they are ready to pupate in preparation for the winter. I’ll keep on the lookout for others, there are still plenty of hardy, determined caterpillars out there. Brigette is a graduate student who studies caterpillars. She likes to talk about insects, evolution, illustration, sewing, powerlifting, and her pet rabbits. All text and images © Brigette Zacharczenko 2011-2014 and may not be used without permission. Blog posts or other methods of sharing my work with credit to me and links back to my blog are allowed. Absolutely NO commercial use or derivations of my images are allowed without express written permission. Trying to make sense of the world through science and language.